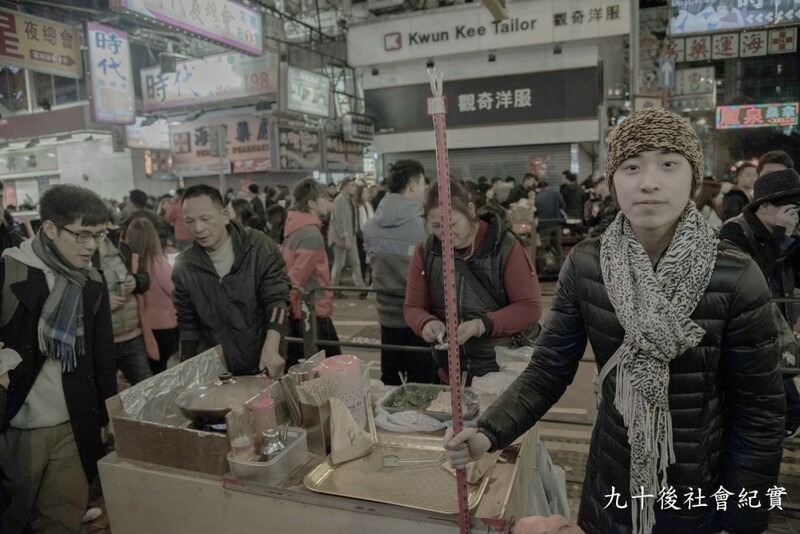 8 February, 2016 11:18 pm Street hawker set up food stores at Mongkok, near the Langham Plaza to celebrate Chinese New Year, unlicensed yet untouched in previous years. 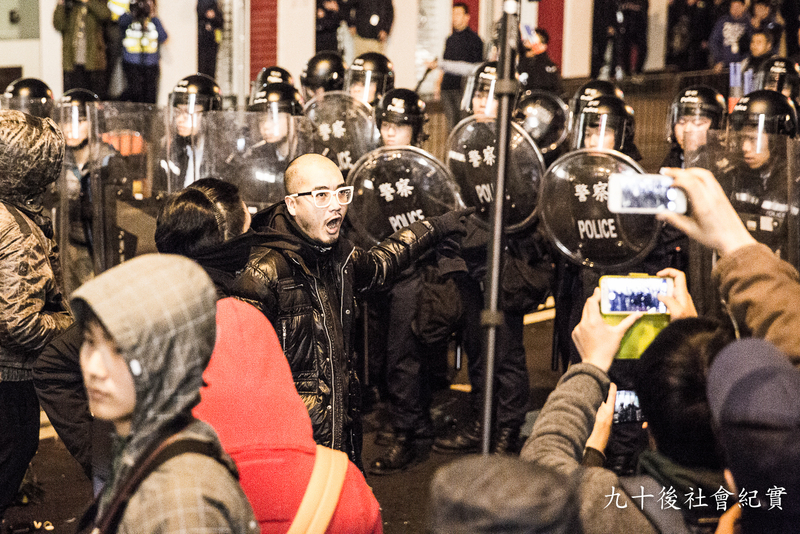 Monday, 8 February, 2016 11:50 pm Ray Wong spotted Police’s movement to matching into the night market, asked the crowd to step forward. 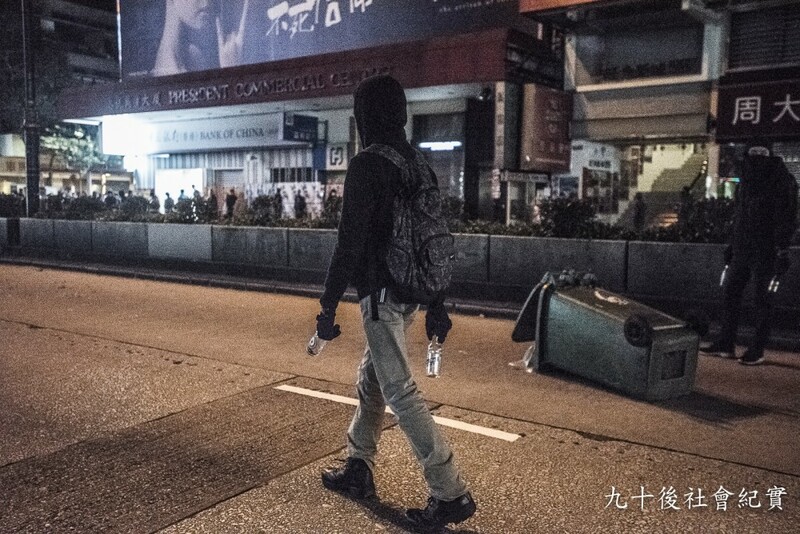 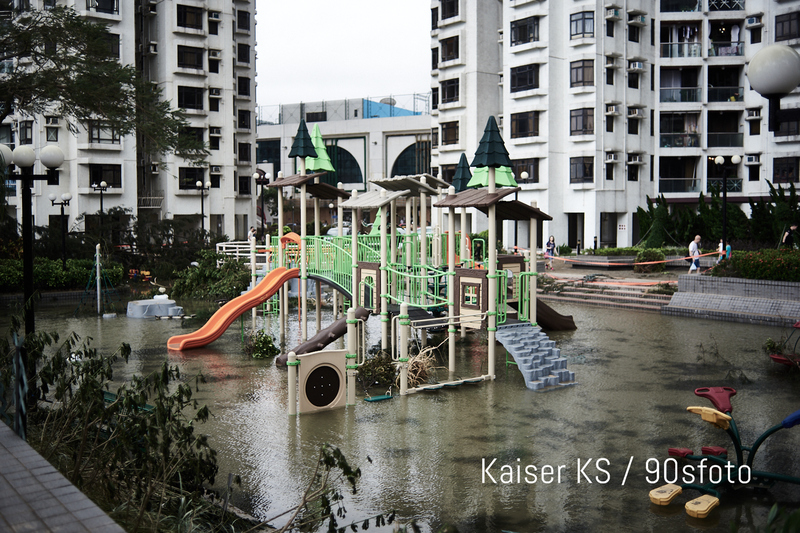 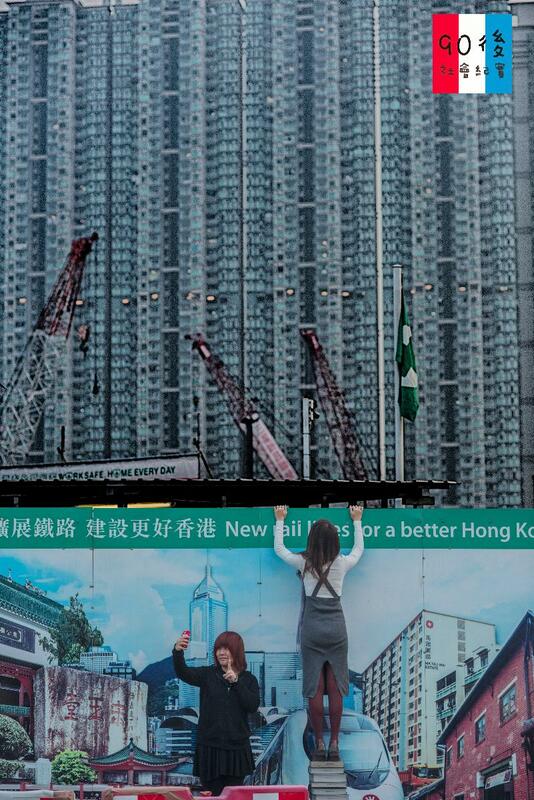 Monday, 8 February, 2016 11:51 pm Raphael Wong tried to alleviate the situation. 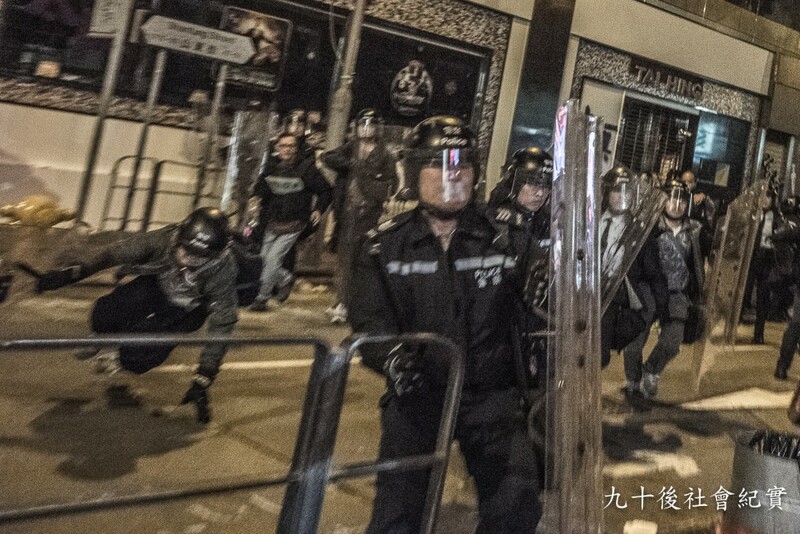 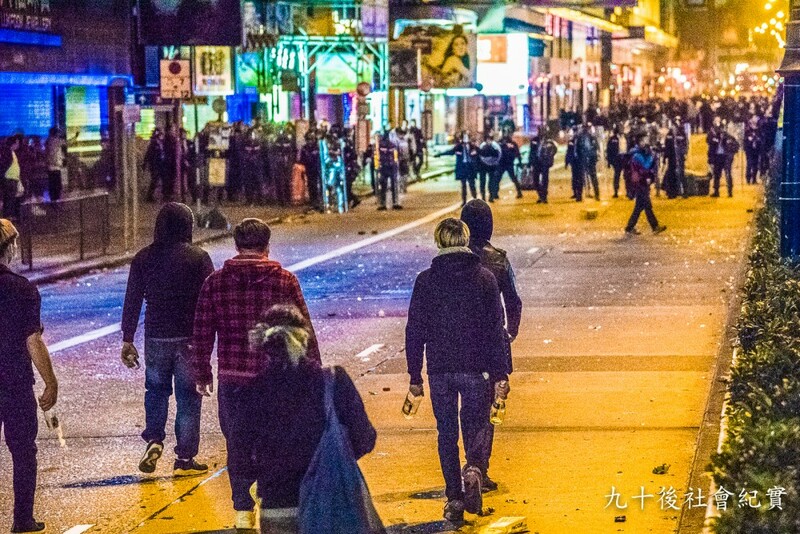 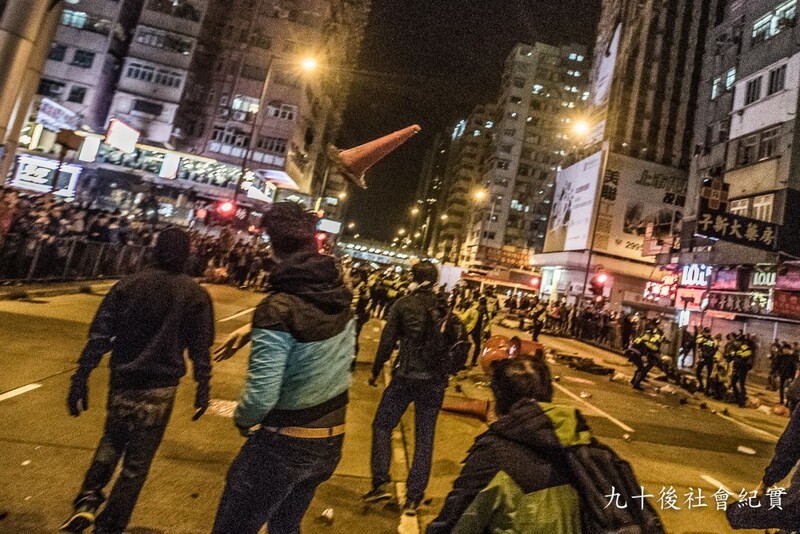 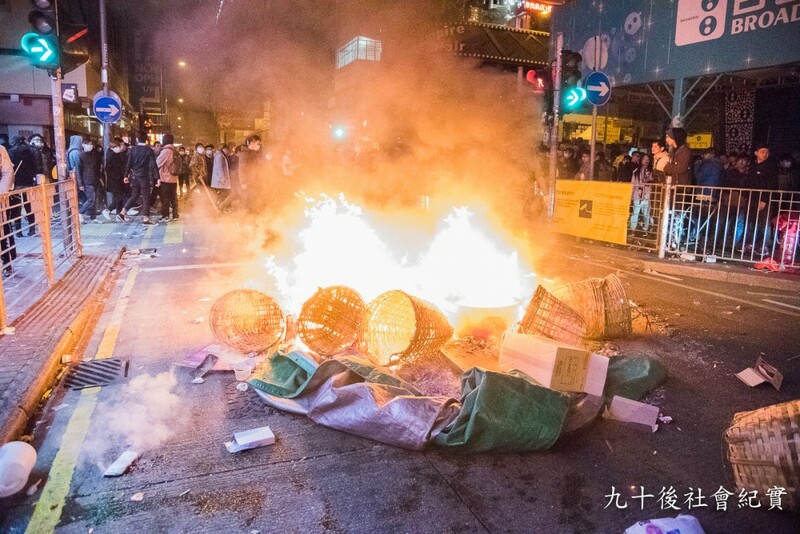 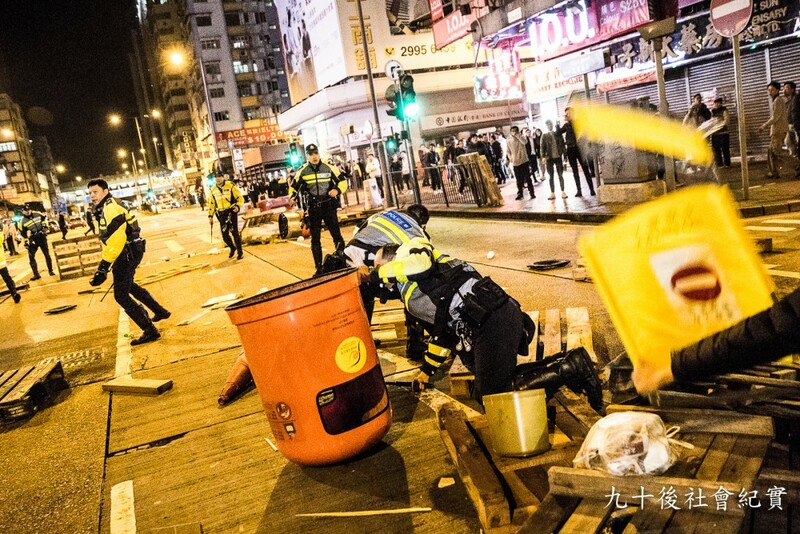 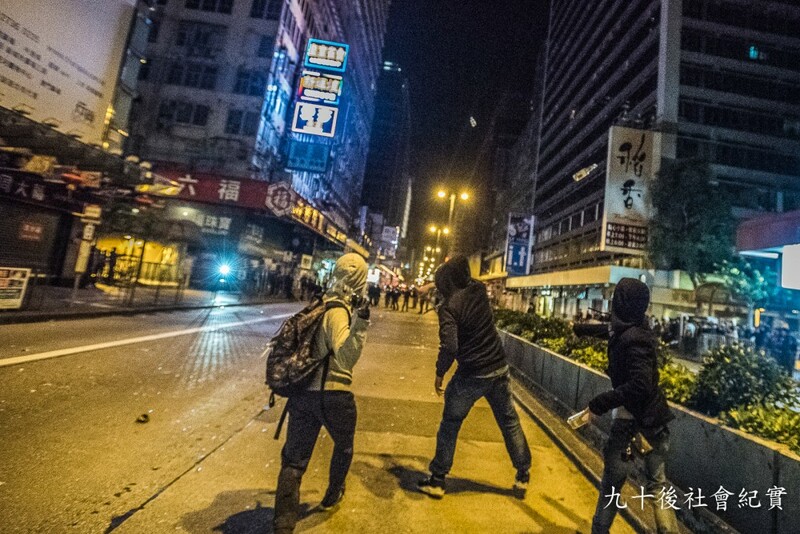 Monday, 8 February, 2016 11:54 pm Armed with clubs and shields, Police tried to drive away the hawkers and local citizens. 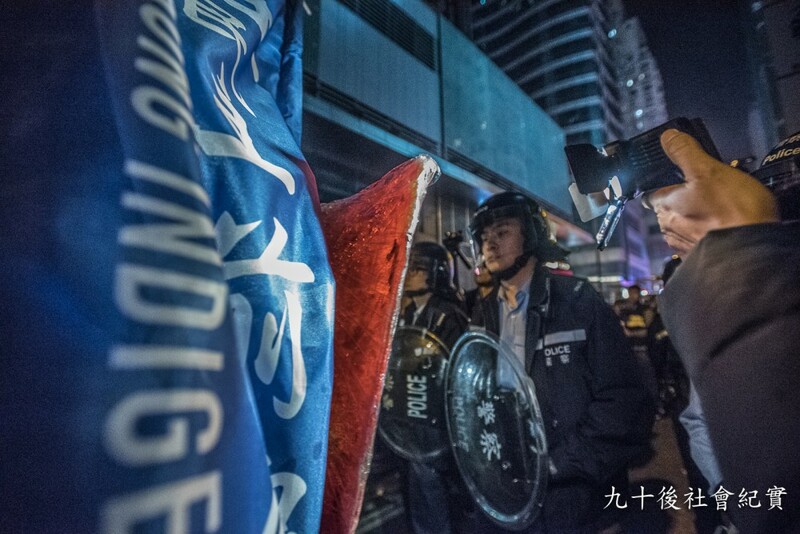 High stands were set up for Police recording. 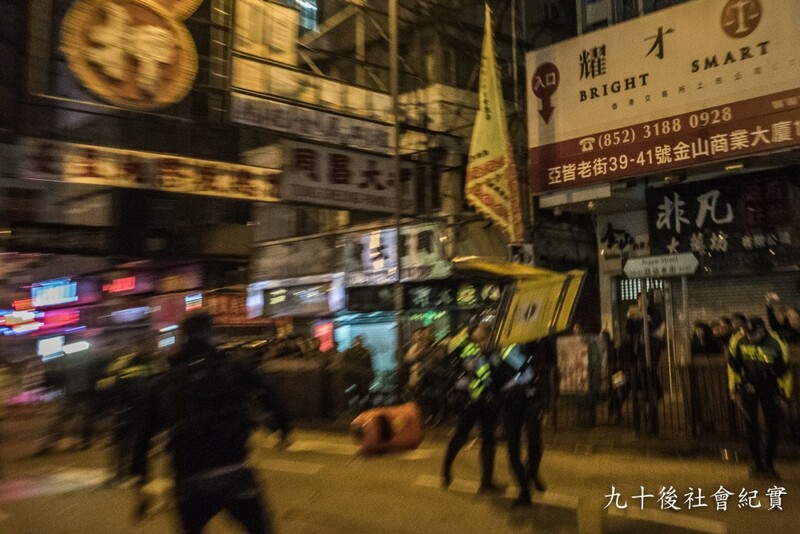 Monday, 8 February, 2016 11:56 pm Police’s armed marching continued towards unarmed hawkers and ordinary customers. 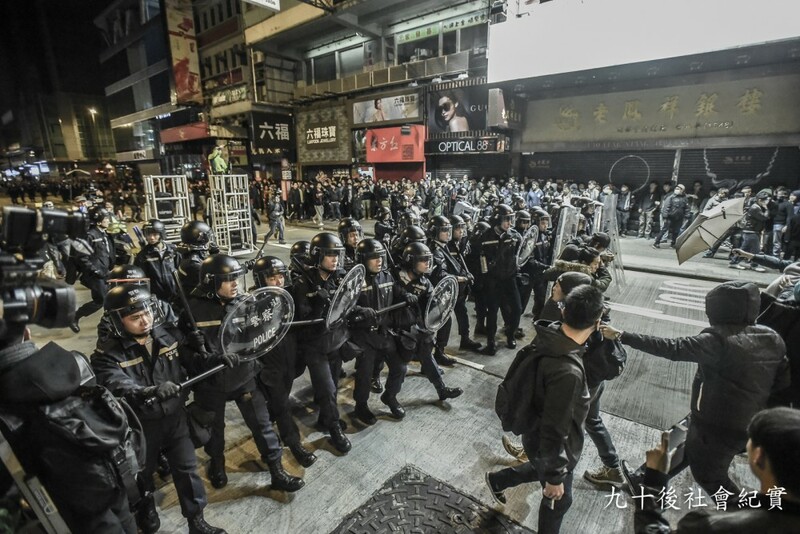 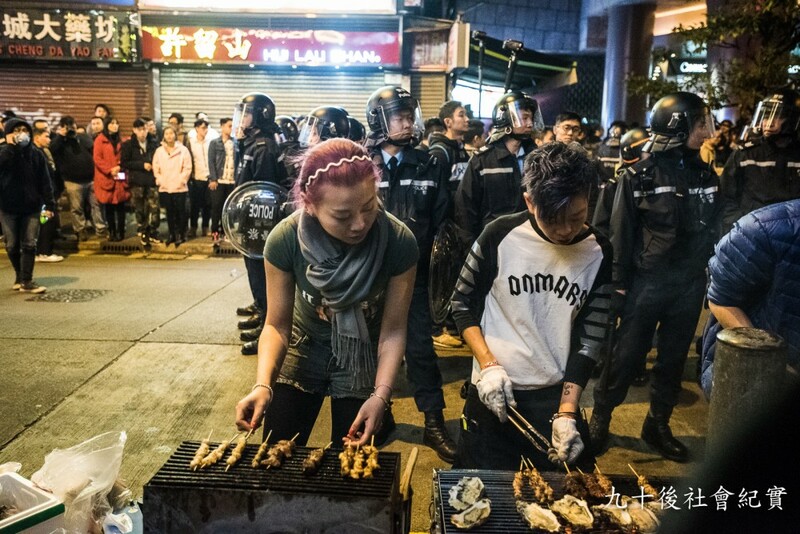 Tuesday, 9 February, 2016 12:27 am Police seized their movement for a while, some of the hawker stores continued operation. 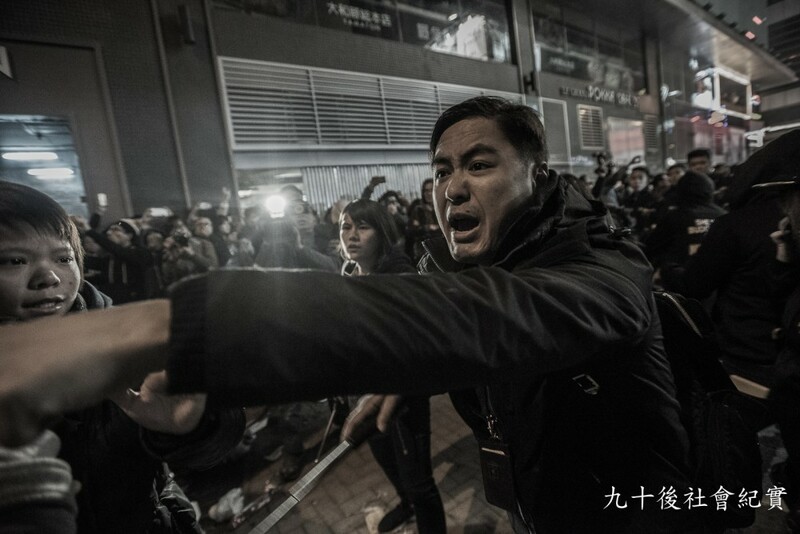 Tuesday, 9 February, 2016 12:27 am Hong Kong Indigenous announced in Facebook that Candidate Edward Leung Tin Kei of upcoming LegCo by-election used his campaign authority, to raise a campaign demonstration at Mongkok Night Market with immediate effect. 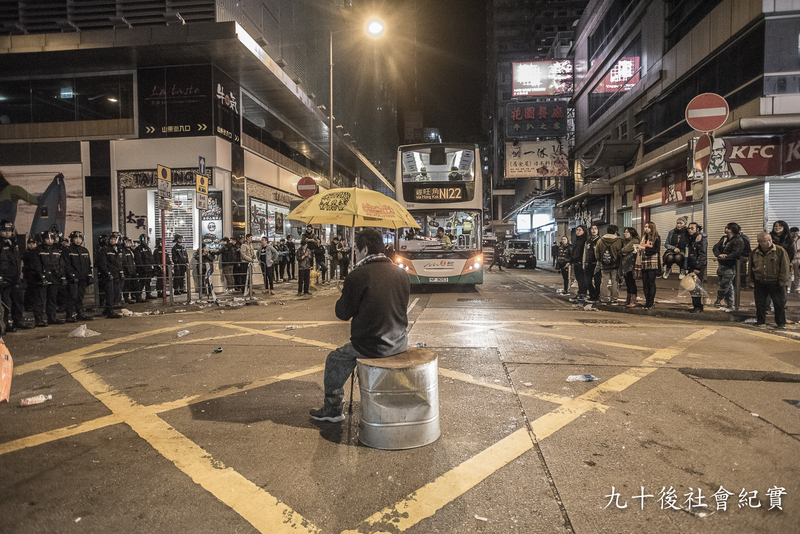 The demonstration was claimed having less than 30 people and the government’s approval was not needed. 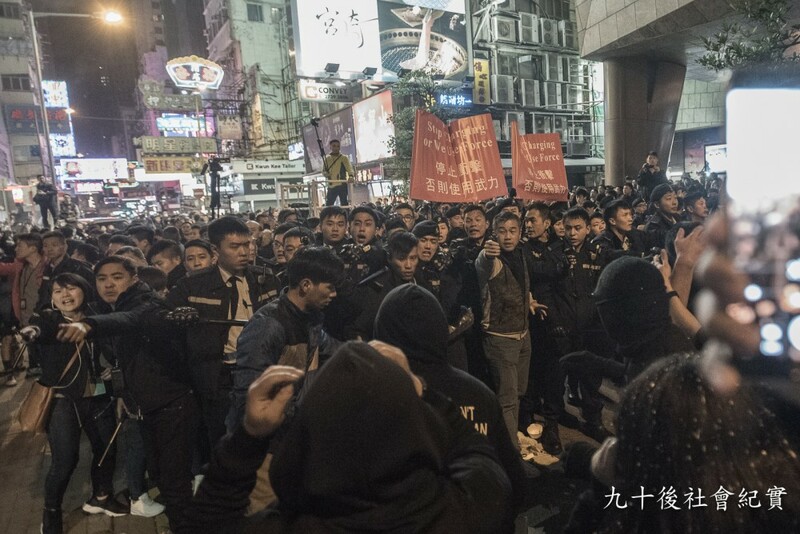 The party asked for people’s coming to Mongkok for support. 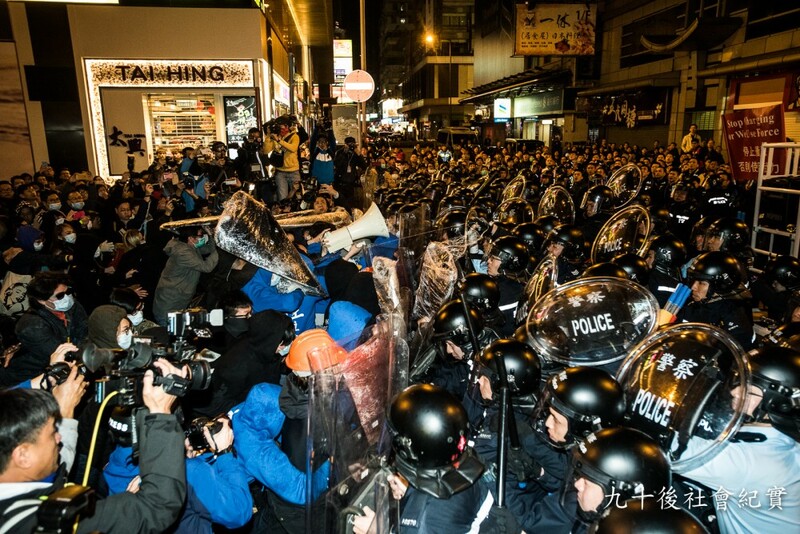 A large group hence clustered at Portland Street, causing a traffic congestion. 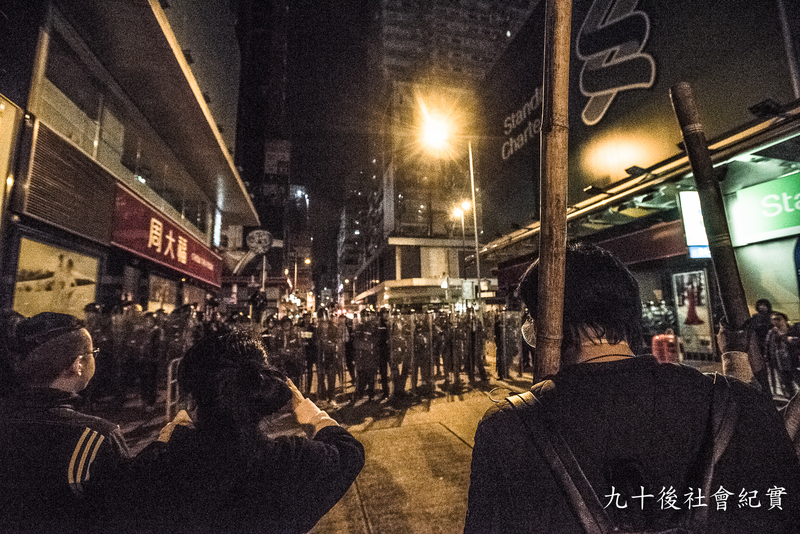 Tuesday, 9 February, 2016 1:05 am Police were on their position. 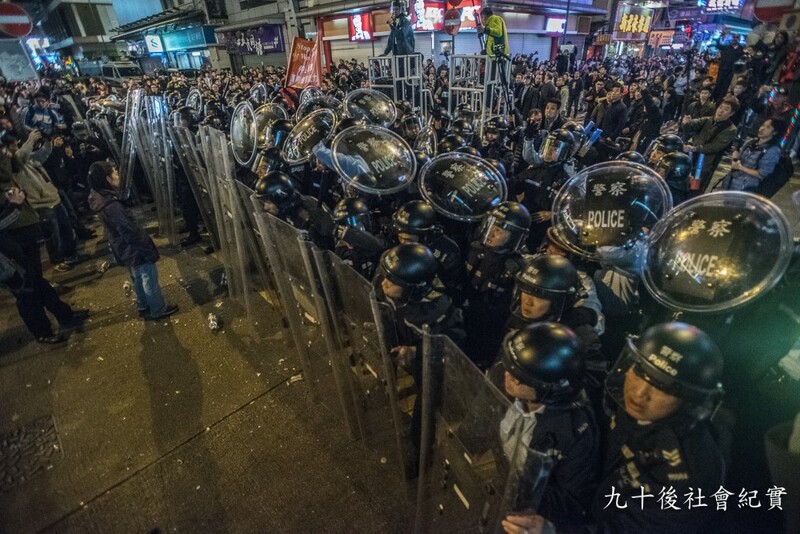 Tuesday, 9 February, 2016 1:05 am Full-geared Police were at their positions, long shields, round shields and clubs were visible. 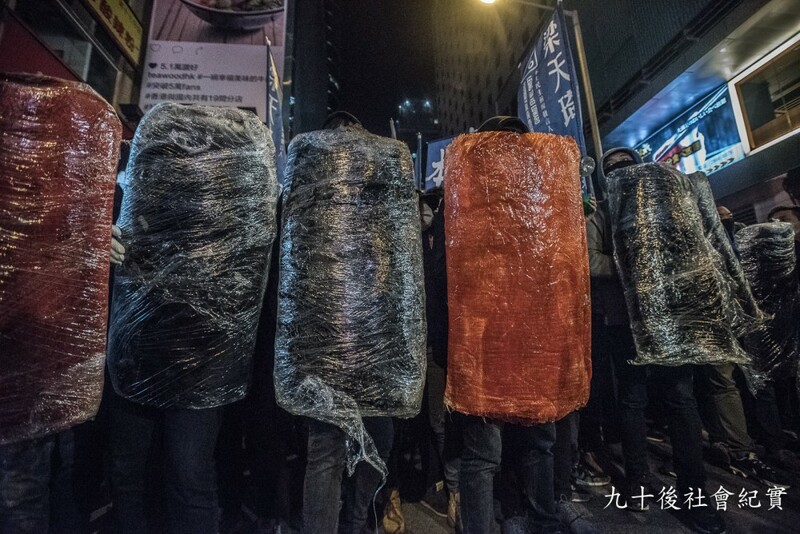 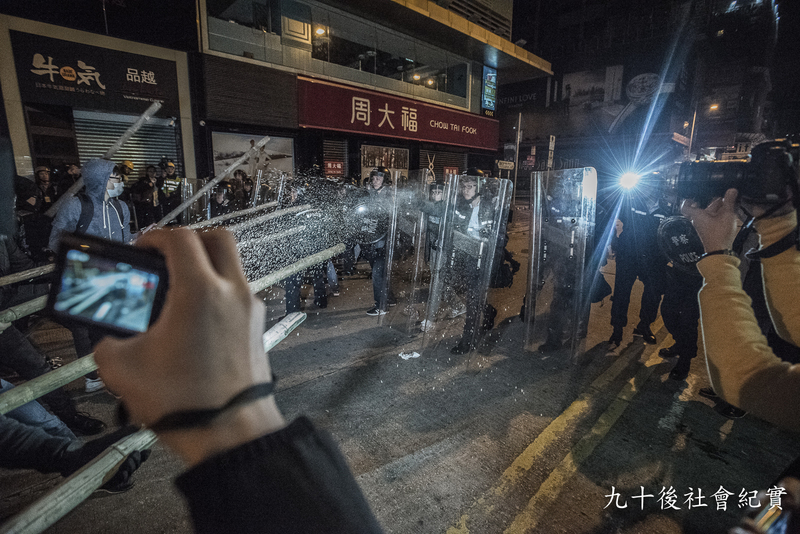 Tuesday, 9 February, 2016 1:32 am Hong Kong Indigenous demonstrators tried to force their way through the Police. 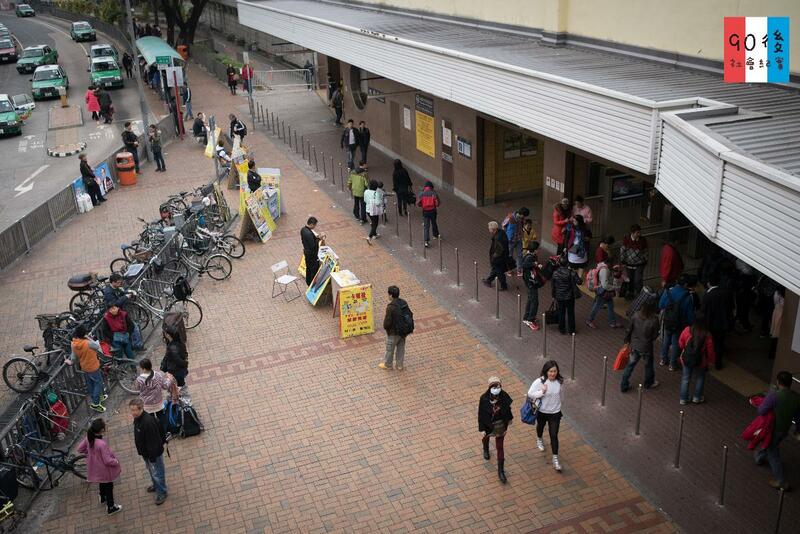 (Pic 2) Pushing around. Tuesday, 9 February, 2016 1:32 am Hong Kong Indigenous demonstrators tried to force their way through the Police. 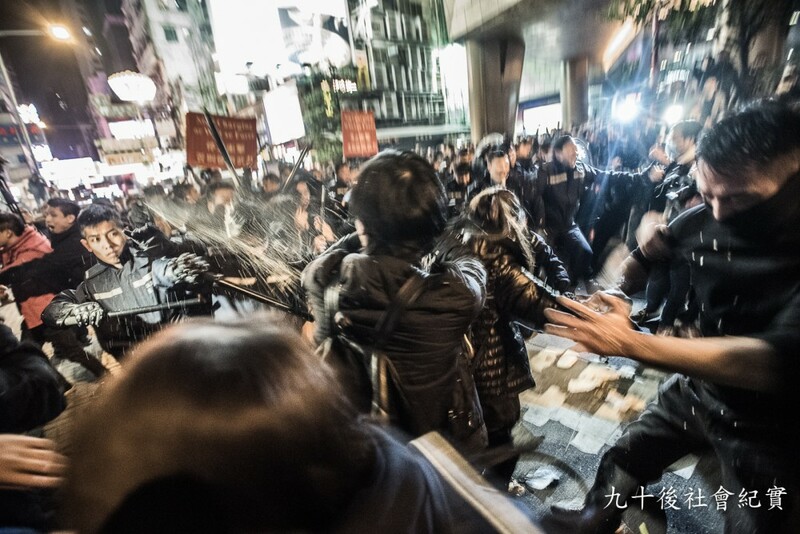 (Pic 2) Police used the pepper spray and police clubs. 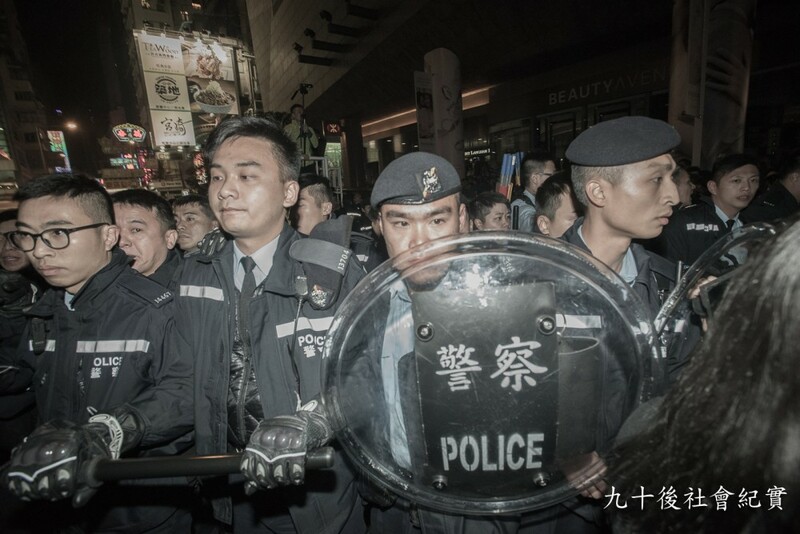 Tuesday, 9 February, 2016 1:58 am Pushed on by the police, Hong Kong Indigenous retreated to Argyle Street. 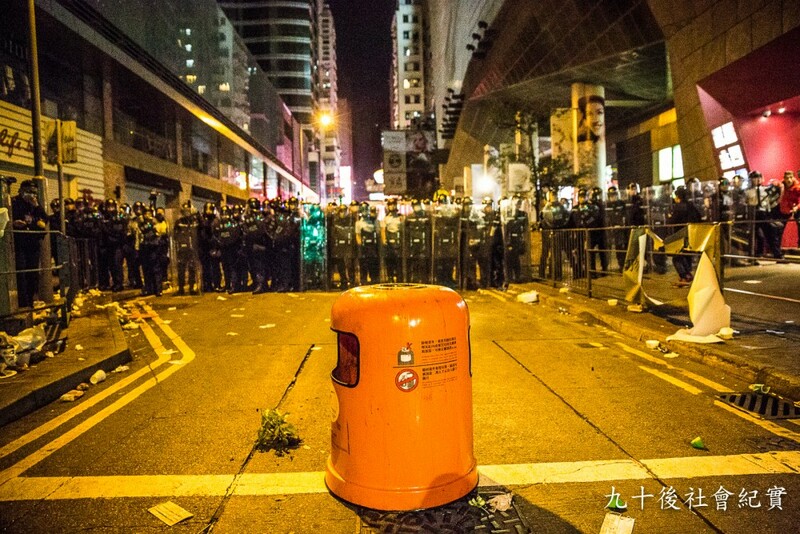 Tuesday, 9 February, 2016 2:03 am Garbage, garbage bin and plastic fences were thrown at Traffic Police, so one of them fired 2 warning shots in the air. 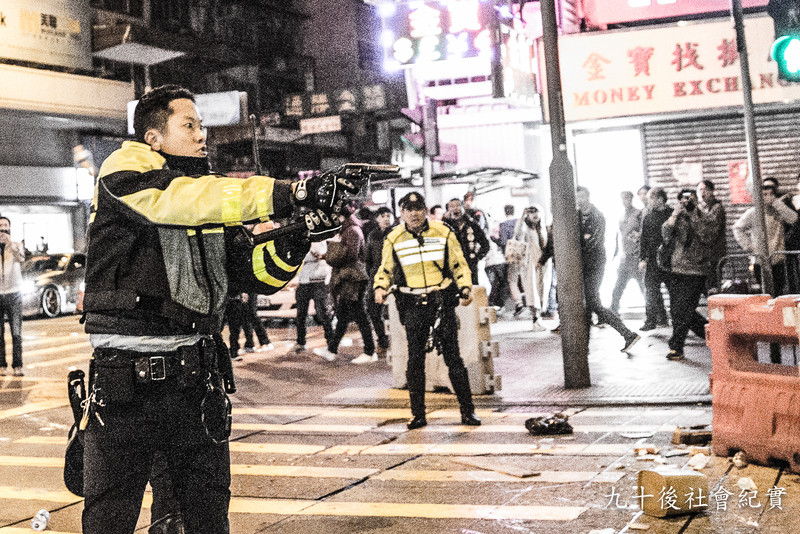 (Pic 1) With his finger still on the trigger, the policemen pointed his firearm to the demonstrators. 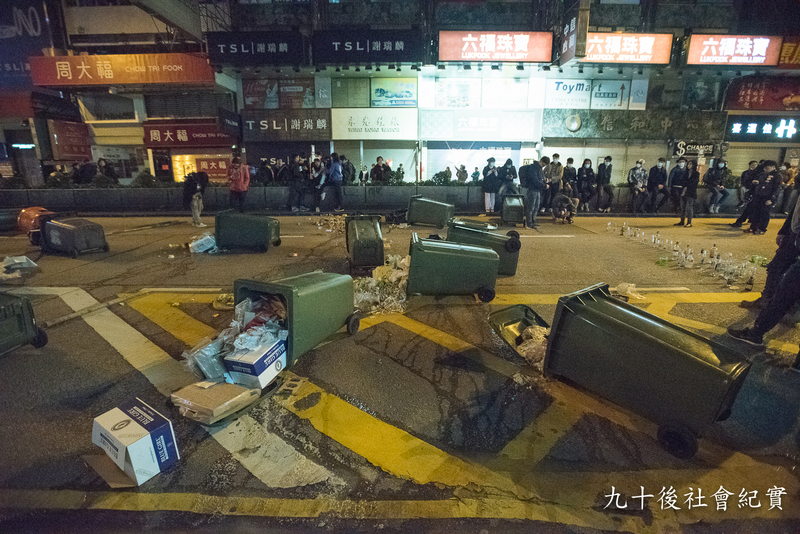 Tuesday, 9 February, 2016 2:03 am Garbage, garbage bin and plastic fences were thrown at the Traffic Police, so one of them fired 2 warning shots in the air. 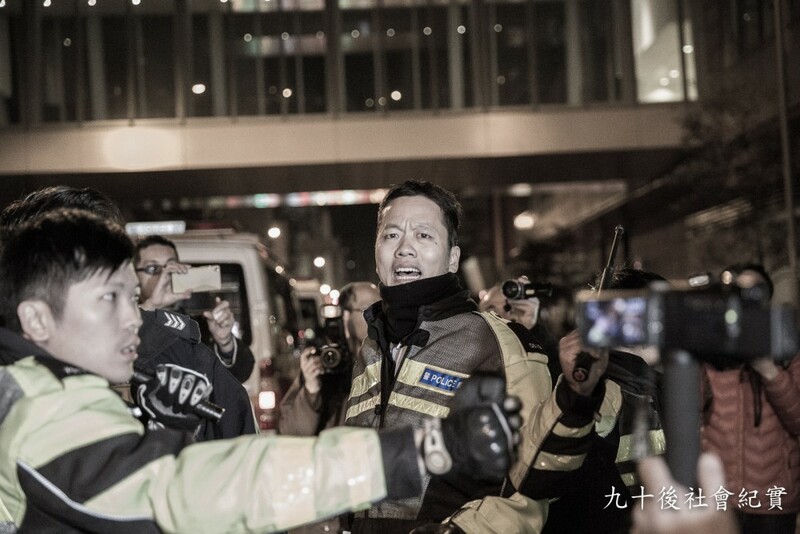 (Pic 2) With his finger still on the trigger, the policemen pointed his firearm to the demonstrators. 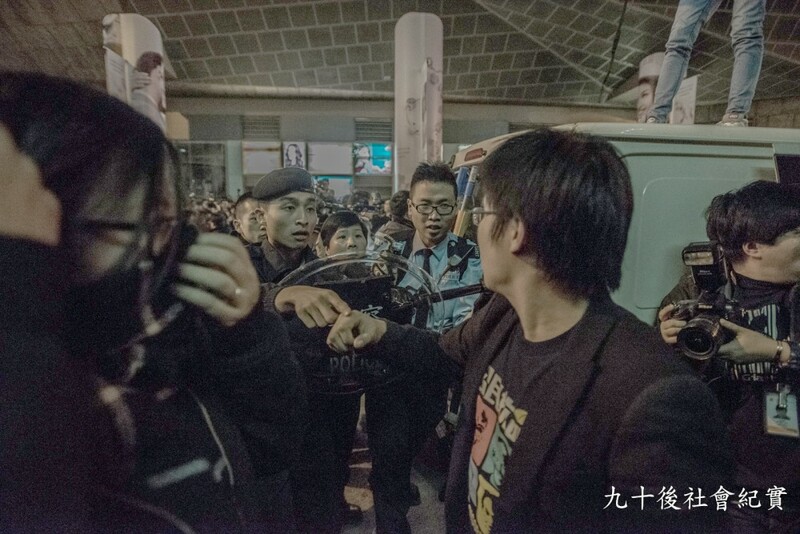 Tuesday, 9 February, 2016 3:21 am Wong Yeung Tat was present. 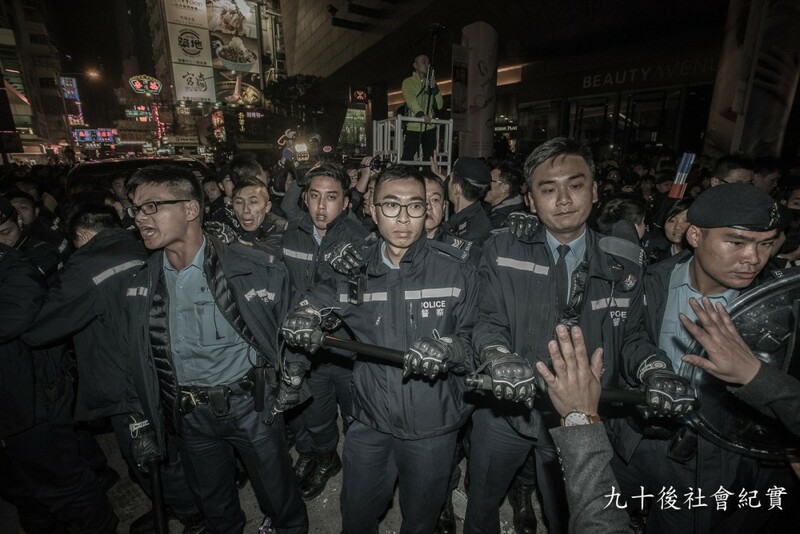 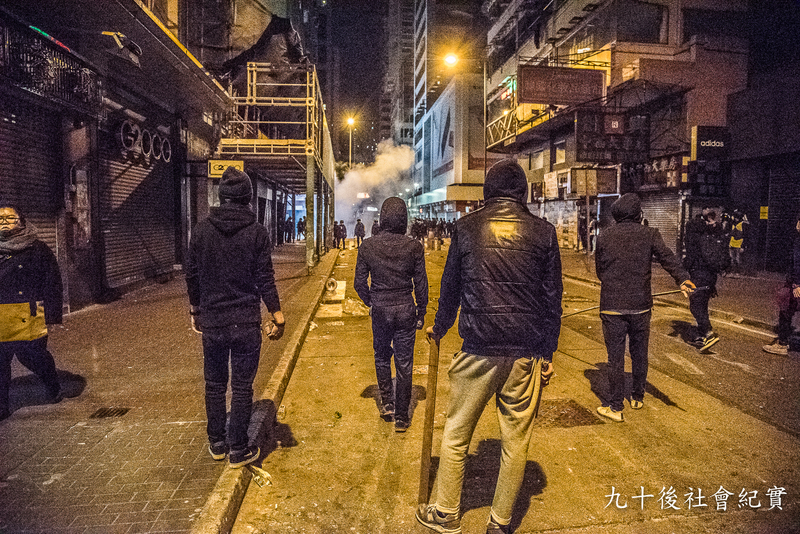 Tuesday, 9 February, 2016 3:46 Police met a group of demonstrators armed with bamboo sticks when they proceeded. 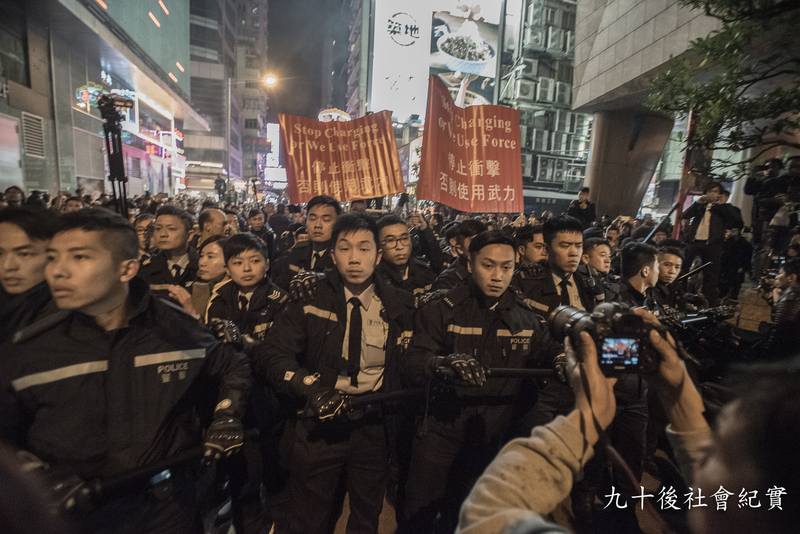 Tuesday, 9 February, 2016 3:46 Police met a group of demonstrators armed with bamboo sticks when they proceeded. 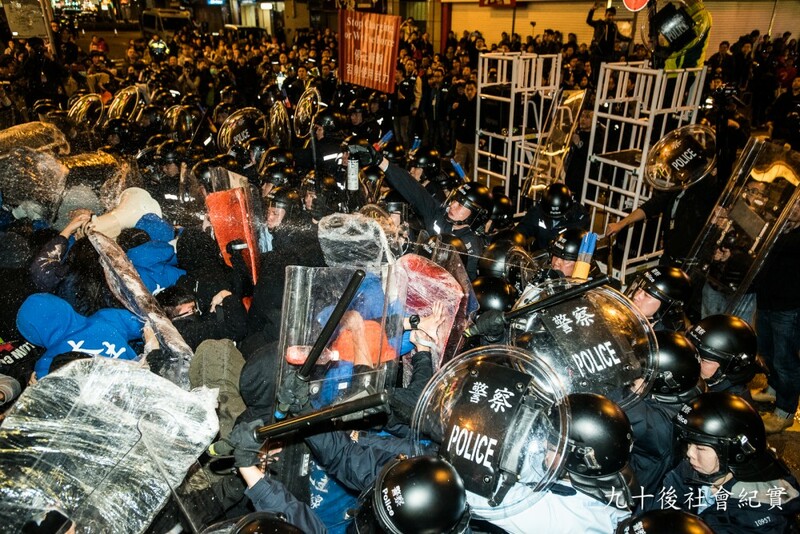 They used long shields and pepper spray. 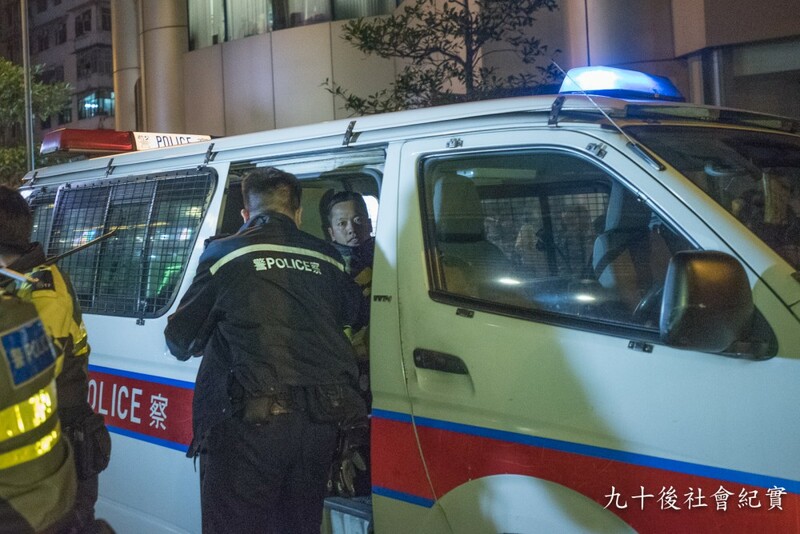 Tuesday, 9 February, 2016 3:46 A policeman fell down on his knees when the team proceeded. 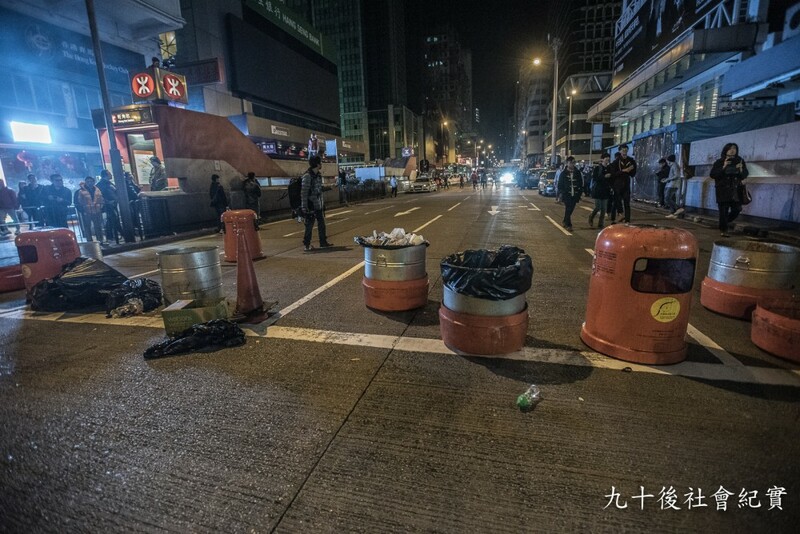 Tuesday, 9 February, 2016 5:04 am Garbage and garbage containers were used as roadblocks. 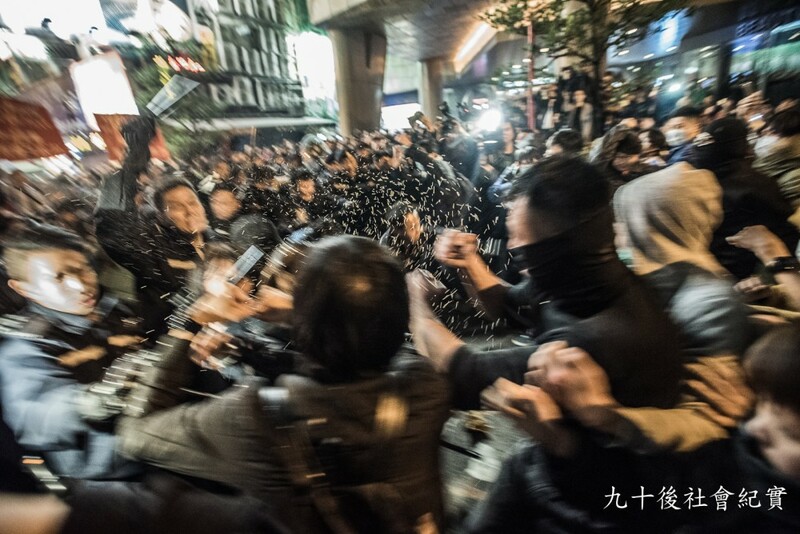 The fight continued till dawn, the crowd dissolved itself at 7am. Empty bottle throwing continued, armed police threw back as a return. 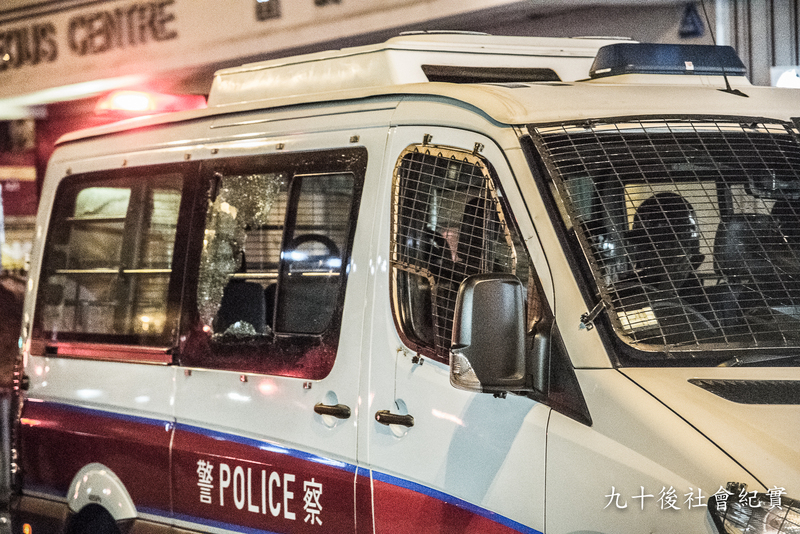 A window of police car was shattered by demonstrators’ throwing brick. 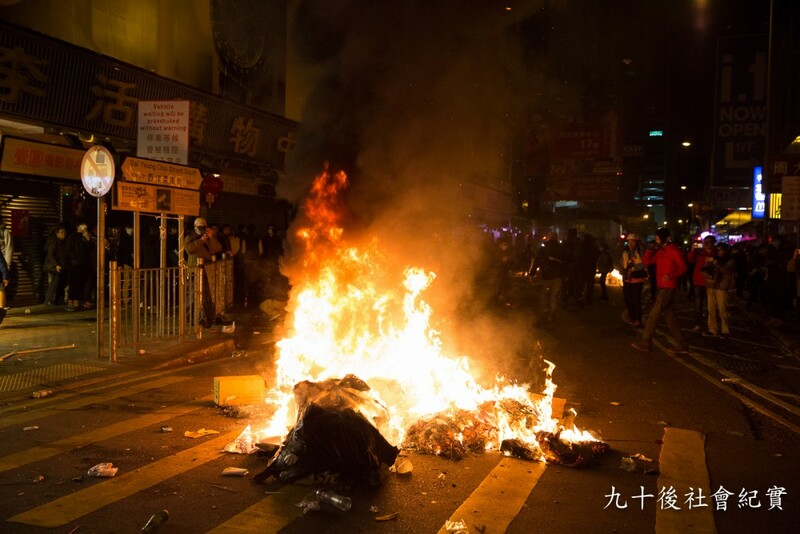 Garbage was burned by demonstrators, no one was hurt. 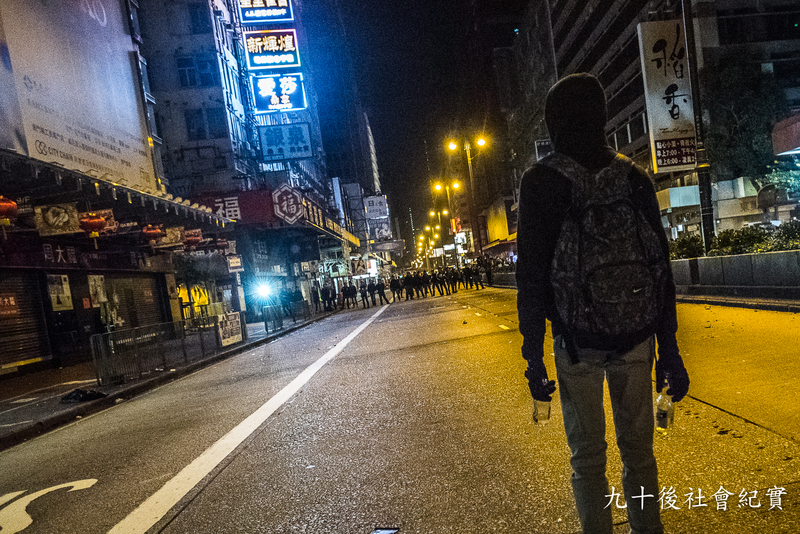 Demonstrator armed with bricks and wooden sticks. 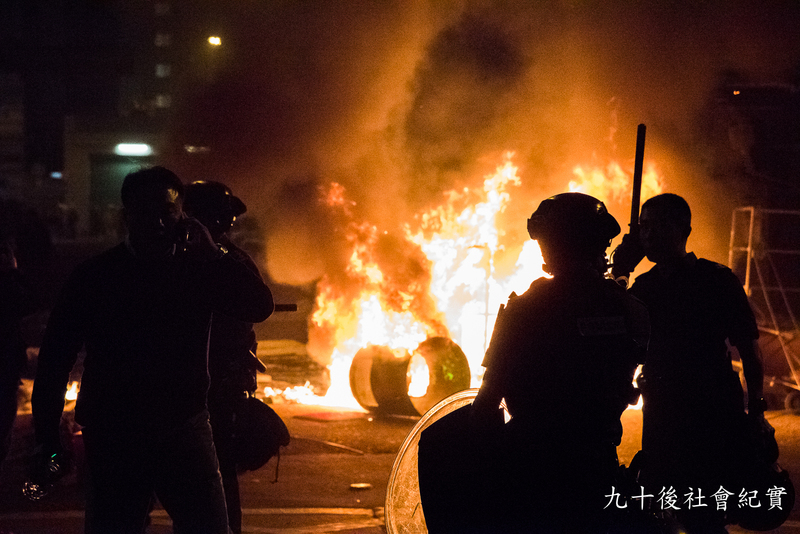 Armed police reporting in front of burning garbage.